Home > Posts > News > Economic life > Come and discover Lyon’s silk! Silk was a Chinese discovery and as such was confined to this country for many centuries. It arrived in Europe – in France, to be more precise) in the late Middle Ages. Production began circa 1466 upon the order of King Louis XI. Lyon was chosen as a production site in view of its proximity to Italy, from whence France procured its silk at the time. At the time, there were many fairs introducing silk goods to the general public, which made rolling out such a vast silk-producing industry much easier. . During the reign of Henry II (1547-1559), production soared before declining for a forty-year period, due to religious wars. 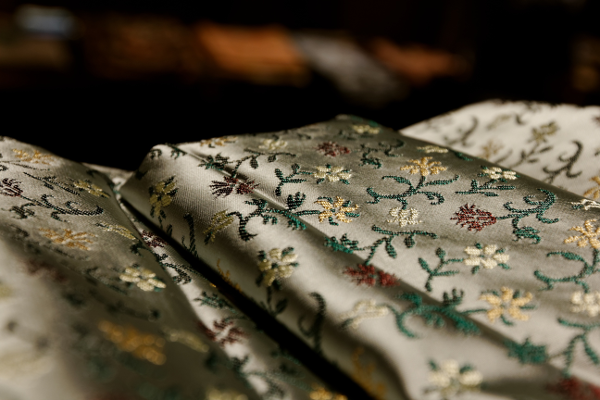 Lyon, therefore, had to equip itself with looms to enables its weavers to produce different products such as satin, velvet and cotton sheets; Initially simple pieces and later more intricate designs. At this time, France needed to export its silk products throughout Europe, and gained quite the reputation by doing so. Then, political instability and revolution led to a financial and social crisis and ultimately a riot of Lyon’s weavers. 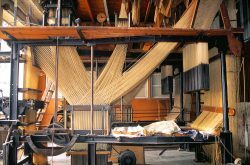 It was only in the mid-20th century that the loom was successfully mechanized, and many improvements followed, in particular with the arrival of electricity. Unfortunately, this was also the period when new types of yarn were invented. Over time, their manufacture became less expensive, meaning that manufacturers were more likely to use nylon, viscose or polyester instead of silk. The silk sector in Lyon was a precursor to the economy of its time. In the 16th century, silk production required 12,000 employees and 3000 looms. 200 years later, the number of looms had multiplied by four, and the number of employees had more than doubled. The situation changed as the 21st century approached: the number of weavers decreased significantly. Today, those manufacturers who still operate, do so either for luxury brands, or in the interests of history and preserving the tradition. Their clients are usually museums, few individuals purchase silk now. Le carré de soie: boutiques, and hand painted and hand woven products. Whether you’re a silk fan or just curious to learn more, there is something for everyone! More information about Lyon's industry, contact us !